Take I-195 East to Exit 7, Rte. 114 South to Barrington. Follow Rt. 114 through the town of Barrington. Go over two small bridges into Warren. After the second bridge there will be a traffic light, at the traffic light bear right onto Water Street. Follow Water Street for about a half a mile. Just beyond the Warren Little League field you will see a cluster of steel corrugated buildings. The office building is located at Gate 2. 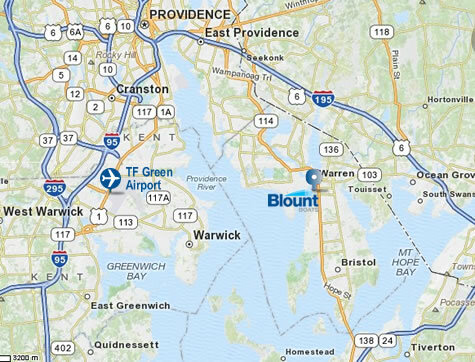 Take the Mount Hope Bridge from Portsmouth to Bristol. After passing the main gate of Roger Williams University you will see a stop sign, bear left at the fork onto Rt. 114. Continue on Rte. 114 through the center of Bristol. Follow Rt. 114 to Warren. At the first traffic light after entering Warren take a left onto Campbell Street. At the end of Campbell Street, take a right and a quick left into Gate 2 of the Blount Boats complex. Take Exit 4B onto Rt. 103 West. Follow Rt. 103 West until it ends in the center of Warren. At the stop sign take a left onto Main Street. At the first traffic light take a right onto Campbell Street. At the end of Campbell Street, take a right and a quick left into Gate 2 of the Blount Boats complex. Copyright © 2019 Blount Boats & Shipyard – Commercial Boat Builders – Warren RI All Rights Reserved.